Australian cricketing legend David Boon picks up the willow after 10 years at Greenfield International Stadium. THIRUVANANTHAPURAM: In his heydays, you wouldn’t bet against David Boon slashing a full-pitched delivery beyond the fence of a cricket ground. But, on Wednesday, when one of the young trainees of the KSFL - Tenvic Cricket Academy hurled one in his way in the cricket nets of the Greenfield International Stadium, Kariavattom, the Australian legend was taken aback but recovered just about to middle the ball with his willow. The Aussie legend, who produced a man of the match innings to take his country to its first world title in the 1987 Reliance World Cup at Eden Gardens, Kolkata, was in the capital city as part of a high-level delegation from his home state of Tasmania to meet top government officials, including Chief Minister Pinarayi Vijayan, and entrepreneurs to improve the bilateral relationship between the states. “I have to be honest that this is the first time in 10 years that I have picked up a cricket bat! And with bifocals, your depth perception isn’t that great. The fast ball thrown by the youngster took me by surprise,” said a cheery Boon, who now sports a bespectacled look but still has his trademark moustache intact albeit it has more greys in it. In the function organised by Kerala Cricket Association (KCA), Boonie, as he is popularly known, interacted with the trainees of KSFL Tenvic Cricket Academy and KCA’s CASH Kerala academies. He also took part in a brief training session in the nets watching the kids go through the sessions as well as facing a few deliveries from the cricketers. “It was fun and it is always good to be with the kids. They are the future of this game,” Boon said. 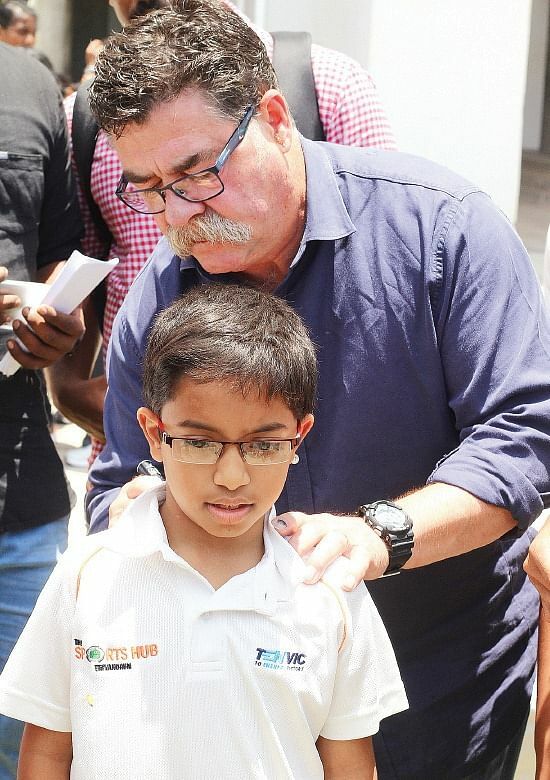 The Aussie, who is now a member of the Elite Panel of International Cricket Council Referees, also inspected the stadium at Kariavattom and made suggestions that will enable it to qualify as an ICC international venue,” said KCA president T C Mathew. It was also announced during the function that KCA will sign a memorandum of understanding with IL&FS, operators of the stadium, to maintain the stadium for the next 13 years paving way for international cricket and Indian Premier League matches in Thiruvananthapuram in the near future. “Since the cricket association desires to make it a multi-purpose venue football, they are planning to use drop-in wickets which are a complex process. But I am sure they will approach other bodies around the world for the expertise,” Boon said. “I am sure when BCCI inspects the ground, the stadium will breeze through the procedure,” he added. “The outfield here is lush, the field is big enough and infrastructure is excellent. Walking around the stadium, you can feel it is thought of very well to work for both cricket and football with two separate style dressing rooms and dual access for players among others,” he added.